Home » Blog » Positive HPV: Now What? HPV, or Human Papillomavirus, is a term we have become more familiar with in recent years. While many women may recognize the word, their awareness may stop there. 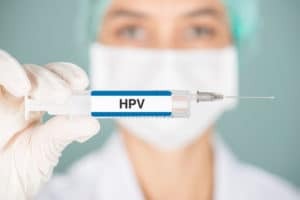 Without basic knowledge of Human Papillomavirus (like the fact that there are several strains), a woman who receives a positive HPV test may be overwhelmed with questions. Does having HPV mean cancer? How could a sexually transmitted disease have developed? What now? We want to help our patients avoid unnecessary stress, so will offer details of HPV here. Experts believe that most sexually active people are affected by one of several possible strains of HPV at some point. It is for this reason that testing methods continue to evolve and women are encouraged to maintain regular checkups and appropriate screenings from their doctor. Currently, HPV testing may coincide with a woman’s routine PAP smear, which collects a small sample of cells from the cervix. An abnormal PAP may indicate the presence of HPV. More than 100 different strains of HPV exist. These are categorized into high-risk and low-risk groups. Interestingly, the strains that cause noticeable symptoms, such as genital warts, are in the low-risk category. They are not likely to lead to cancer. Strains that alter cervical cells may lead to cancer so are considered high-risk. Abnormal PAP results may indicate HPV. However, statistics suggest that HPV most often runs its course and resolves over time. Only 5 to 10% of cases evolve into cervical cancer. In the instance of a positive HPV result, what most doctors do is monitor the situation closely. This may involve more frequent PAP screens. If after a repeat PAP, there is no evidence of HPV, further screenings are scheduled according to age (every three or so years). Positivity for HPV may also be managed with lifestyle habits that support a healthy immune system. Eating well, staying hydrated, and resting as needed promote systemic wellness that allows the body to fight infection successfully. In some cases, a positive HPV screen may be followed up with additional testing. A colposcopy may be scheduled if strain 16 or 18 is found during a routine PAP. This advanced test looks more closely at cervical cells and offers the opportunity to sample a small piece of tissue for microscopic evaluation. HPV is common and somewhat difficult to prevent. The American College of Obstetrics and Gynecology encourages women (and men) aged 11 to 16 to get vaccinated against HPV. Beyond vaccination, it is routine screening that protects women from the adverse effects of Human Papillomavirus. Schedule a well-woman visit at Grace Obstetrics and Gynecology. Call our Fort Worth office at (817) 776-4722 for more information. Our offices are located in Willow Park, Cleburne, Granbury, and Fort Worth.